We periodically get asked why there seem to be so few "pale" Alchemy Stones. 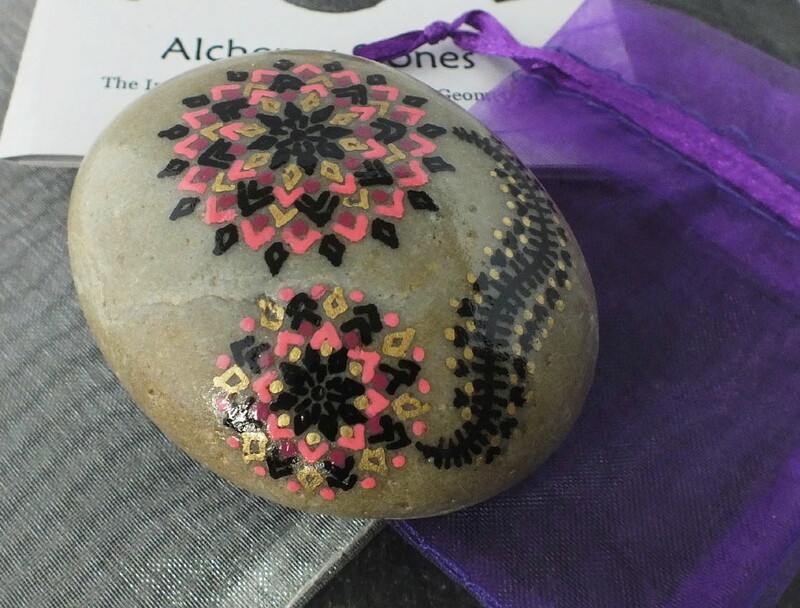 Or... sometimes people want to know why almost all Alchemy Stones are dark or black, when there are usually 100s of different stone colors found on virtually every beach. It's definitely true that lighter colored stones seldom show up in our collection. There are a few good reasons for this. A lot of pale/white rock is quartz/granite based, and is made up of actual crystals ranging in size from a grain of sugar to... well, several inches across. Since we have deliberately made the choice to only work with naturally tumbled beach stones, we have to work with what we can find. Most of the time, these pale stones never get truly smooth surfaces-- their surfaces are more like the skin of an orange, and the numerous tiny "pits" cause paint to flow in all sorts of directions... mostly directions where I don't want paint. 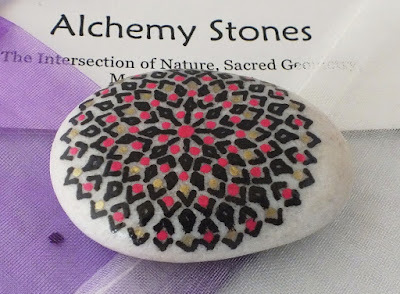 The mandala patterns on Alchemy Stones are extremely accurate and detailed... so it's simply not possible to paint them on a "rough" surface. That said, some of our large "Garden Stones" often have less smooth surfaces... it works because the level of detail on Garden Stones is much lower. Occasionally, a pale stone will appear to be very smooth. I'll bring it home and wash it... and then start painting, only to discover that it actually has thousands of minute "fissures" (cracks) in the surface. Paint-- being liquid-- will follow any path open to it... so what starts as a straight line will look "feathered" within 10 seconds as the paint flows to fill these tiny cracks. Again, these just can't be painted well, so I generally avoid them. By contrast, many dark stones are formed as a result of very finely powdered silt (like fine grain clay) turning into rock in the course of millions of years. These very tiny grains of silt allow for an extremely smooth and crack-free surface to form, clear of any tiny cracks to "misdirect" the paint. One final issue I come across is that many pale stones (especially in the granite family) are not a uniform color-- they are actually patterned and multi-colored, like a granite kitchen countertop. Why is that a problem? That's a matter of personal aesthetic preferences, I suppose-- I just can't get it to "look right," a bit like trying to wear plaid and stripes together-- it hurts my eyes! 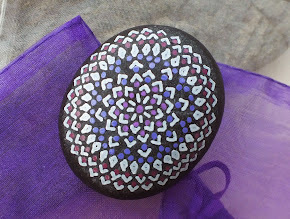 All that said, I do occasionally come across pale stones that turn out to be smooth enough to paint... and they offer a lovely contrast background for darker paint colors, as show in a couple of examples here. Occasionally I hear "Why don't you just put the pale rocks in a rock tumbler?" Well, whereas that might work-- in the functional sense-- it goes against our intention that Alchemy Stones are "natural" and come to you unaltered, with nothing but surface decoration added.